One of my shelters DESPERATELY needs a dog foster home! We're trying to take in a 10 month old french bull dog - Boston terrier mix. He gets a slight head shake when he's excited. He's currently in Cumberland County SPCA and will be put down SOON if we don't get a foster and get him out of there! We have lots of events where he will go to get adopted, so you hopefully won't have him long. But he will die in a couple days if we don't get a foster! Long Beach Island, a set on Flickr. Some of my pictures from the day trip to Long Beach Island last week. You can see I brought Tootie and Kranks, the alien bandits ( or "the critters" as I sometimes call them)! 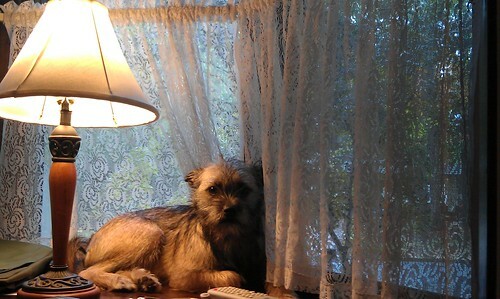 How much is that doggy in the window?, originally uploaded by eblackwell. Daytona had a stomach bug all day. For some reason, he picked this spot in the window as the "security spot" to go, then give me the big eyes "I don't feel so good" look. Remember the birthday when I wrote that long letter thanking you for all you've done for me? I know you kept it the rest of your life and told me how you'd take it out every once in awhile to read it again. 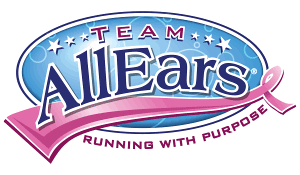 I am raising money for Breast Cancer by participating in Team AllEars, a running team taking part in all the marathon activities at Walt Disney World in January. I am in the Epcot 5k. This one is an actual timed event; I have to complete each third within 15 minutes. If I had that dragon chasing me like they show on the site, you bet I'd make it! Besides, I can't let someone who is pushing a baby stroller beat me! So I will cross that finish line! I have gone back to training, riding my bike and walking, increasing my strength and time. ; I also want to lose weight so I'm in better health and shape. Here's where I need your help. Each Team AllEars member promises to raise $500 for the Breast Cancer Foundation. The Avon Breast Cancer Foundation is a 501(c)(3) public charity (Tax ID #13-612-8447), so all donations are tax deductible. Your support will be donating directly to the Avon Walk for Breast Cancer, via Deb Will’s account. (president & founder of AllEars.net and a breast cancer survivor) ALL money does go to the charity. Anything that we spend as the Team comes from our own pockets (such as event registration, Team clothing, and travel expenses). Last year, the team raised $50,000 and was publicly thanked by the president of the Foundation! There are two main ways donations can be made: online via credit card or by check. This is the preferred method for donations – simplest – easiest – immediate! Scroll down and click on DONATE NOW! New Page opens that starts with Select a Gift Level and Payment Option – fill in. Transaction Summary: Review all the information to make sure it is correct. Double check you have added Team AllEars and my name in the Personalize Your Gift section. Next Page is your donation “receipt”. Please print out this page. You will also receive an email confirmation of your donation. Please forward this email to me for my records or just let me know. I know donating money is tough. So I thank you if you do make a donation and understand if you can't. I hadn't mentioned this before, but our family room and laundry room were flooded weeks ago. Even with a week of using wet vacs etc., we can't get all the water out of the carpet. Black mold is growing on the walls and we've lost furniture. The price just to remove the mold is $3800. That is to gut at least one wall, maybe most of the family room. It is not to rebuilt them, to replace the carpet, or any furniture. Our insurance denied our claim because of a loophole. Fema will only give us $3500. So not even all the mold removal is covered by that. Don't feel bad for us though. John says it is good news. I hate to take the webcams off the blog. Sigh. I will put all the video links to the webcam page (http://www.erinblackwell.com/webcam/) so you can see everything I recorded, along with previous webcam recordings. I want to do a more full trip report and post pictures. Life has just gotten insane as soon as I was back. Cross fingers I can get through it all.